Upadate: 22/10/2013 Almost 1 month later BBM is all set for roll out once again according to BlackBerry Blog. The BBM will be available for android and iOS from today onwards hopefully in next few hours. After you register, you will be put in a waiting list if you are a new user. we suggest you to enroll as fast as possible because the queue will be quite long. You can download it from PlayStore or GO TO bbm.com from your android and iOS phone browser. After you download the app you will have to enter your email to enter the waiting list. You will get a mail when you are all set to use BBM. If you are or ever were, a loyal fan of BlackBerry phones, you will agree that QWERTY keypad and BlackBerry Messenger BBM were a big reason. The good news is that BlackBerry is finally bringing BBM to Android and iOS platform this weekend! For Android users running Android 4.0 or higher BBM will be available on 21st September. BBM will compete with existing messaging services with similar features like WhatsApp, Line Messenger, WeChat etc. The BBM users connect with each other using a special BBM Pin which is more secure and a better option than sharing your phone number. Acknowledgement for delivered and read messages. You will also know if the person you are communicating with is responding or not. BlackBerry has also mentioned that from later this year, BBM Channel feature will also be available for Android and iOS. 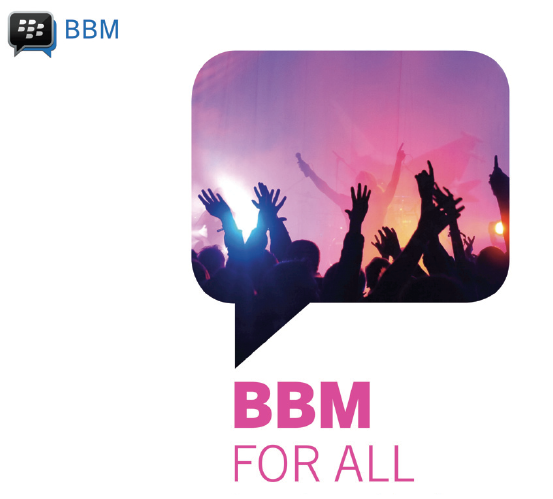 Using this feature a BBM user can subscribe to BBM Channel and join in conversation with popular people, celebrities and Brands. BBM Voice calling and video calling won’t be available for now on Android or iOS. BlackBerry has around 60 million BBM users as of now and this number will drastically increase once this messaging service is available on other platforms. Will this be able to provide a boost to the sinking BlackBerry ship? That will be a tough task but if it cuts through the competition, it will definitely be a much required win for BlackBerry. It will also appeal to those blackberry users who were hesitating to switch to Android or iOS because of BBM attachment. BBM will be available on 21st September for Android users around 4: 30 PM and for iOS 6 and iOS 7 users on 22nd September around 12 am. There is no news of availability on Windows platform right now. You can download BBM for free from App stores.